Discover how Smartsheet can help you improve process efficiency. Businesses seeking competitive advantage often turn to value chain models to identify opportunities for cost savings and differentiations in the production cycle. In an ideal situation, the value chain demonstrates that the cost to build is far lower than the cost the market can bear, but this is becoming more difficult as customer demands grow in complexity and as market competition increases. Additionally, technology and communication methods have changed greatly since Michael Porter introduced the value chain model in 1985. But even with progress and innovation, value chain analysis is still a sound model for identifying market opportunities and achieving competitive differentiation. In this article, we will discuss how value chains require continuous reevaluation, reimagination, and remodeling to meet changing economic conditions. Once established, however, an efficient value chain can lead to great success. Value Chain vs. Business Model: What Are the Differences? Value chains streamline the processes that take a product from concept to market. The integral linkages are supported by both structure and effective communication between direct, indirect, and support components. Direct activities, such as hiring and training human capital, are further supported through appropriate indirect activities, such as record keeping and quality control. Economies of Scale: A true picture of need includes cost analysis for the size of the demand, whether local, national, or global. Learning: Activities that change the environment for efficiency or improvement, such as scheduling, asset use, and office or warehouse layout. Capacity Utilization: Procedures that keep capacity at efficient levels to prevent under-utilization or the addition of unnecessary capacity. Linkages among Activities: Identifying areas of cross-functional improvement through coordination and optimization. Interrelationships among Business Units: Opportunities to share information and resources. Degree of Vertical Integration: Identifying areas of joint integration or, in some cases, de-integration. Timing of Market Entry: Driven by economic or world conditions and competitive position in the marketplace. Firm's Policy of Cost or Differentiation: Identified value integrated into the process. Geographic Location: This includes wages, climate, and raw materials. Institutional Factors: These include taxes, unions, and regulations. Profit models have a long history preceding value chain modeling. In 1758, Francois Quesnay authored Tableau Economique, one of the first published works on the subject. In the mid-20th century, Wassily Leontief outlined interconnectivity between industries through his input/output model. And in 1985, Michael Porter introduced a value chain that expanded Leontief’s input/output model by emphasizing links between primary and support business activities. Porter’s value chain is a framework for developing an analytic structure that follows interdependent activities from raw material acquisition or idea through production and finally, into the hands of a customer. This model is as useful today as it was over 30 years ago because businesses in all industries have the ability to identify alliances or linkages between the discrete activities that contribute to their product development. Porter’s value chain involves five primary activities: inbound logistics, operations, outbound logistics, marketing and sales, and service. Support activities are illustrated in a vertical column over all of the primary activities. These are procurement, human resources, technology development, and firm infrastructure. The generic value chain model visually represents all activities with equal weight. However, value chain analysis emphasizes the real needs of the company. For example, a company that assists after the sale, such as for copiers or air conditioners, has a larger service activity set than a company that performs little follow-up action, such as FedEx or UPS. 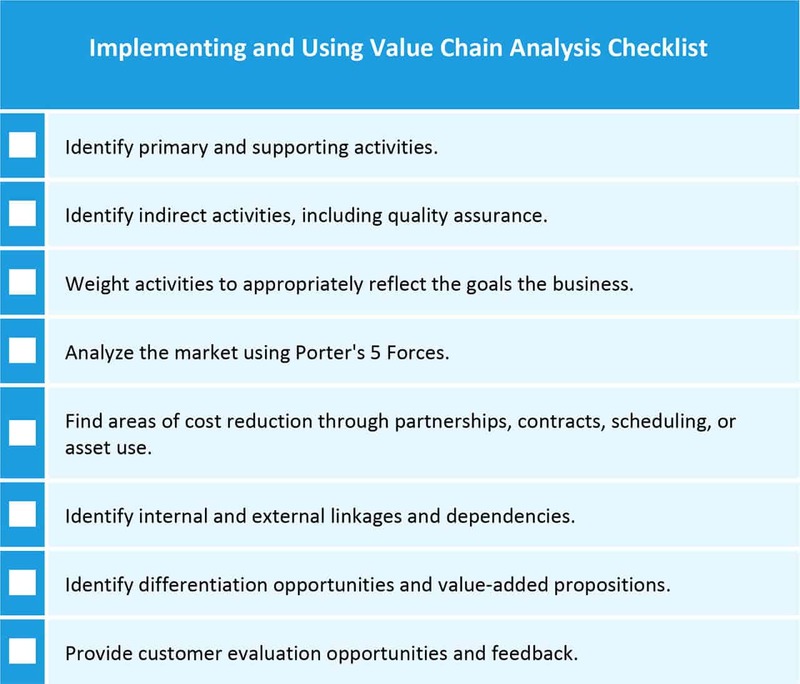 When using Porter’s value chain, you must identify whether you are trying to differentiate or lower costs, prioritize the changes you identify during analysis, and consider how changes will benefit the entire organization. Prior to writing on value chain models, Porter developed a unique competitive analysis tool called Porter’s Five Forces. This tool takes a critical look at competitive market forces in an effort to identify opportunities or risk — it is similar to a SWOT (strengths, weaknesses, opportunities, and threats) analysis. Porter’s tool analyzes changing conditions in order to provide a structure for proactive improvement. Examples of improvements include innovation and cost containment opportunities, exclusive supplier agreements, improved geographic locations for ease of delivery, and the use of unique raw materials and manufacturing processes. This analysis goes beyond a simple identification of competitors; instead, it focuses on how their behaviors, relationships, or ease of market penetration puts pressure on the organization. This helps the organization assess its true market position, mitigate challenges, and find ways to keep up with, redefine, or overtake the competition. Porter’s generic value chain model is both broad and complete, but it is not absolute. Rather, the model is adaptable to the unique needs of each organization. You can think of it as a starting point that demands analysis and adjustment as the marketplace evolves, the competition grows, technology is introduced, or customers demand change. For example, a value chain can help an organization identify in-house and outsourcing opportunities that take advantage of cost savings and specialized expertise. “M&A Solutions uses value chain analysis to identify client providers and attribute earnings to contractors. “If we know that someone adds ‘x’ value per every client, but the contractor has generated far less than ‘x,’ we can drill down to find the problem.” - Anna Knezevic, M&A Solutions Ltd. Along with the value chain, business process management (BPM) can contribute to the success of a business. BPM takes a broad view of business practices, organization structure, purpose, and core strategies. It advocates end-to-end strategies that provide clarity of purpose, resource alignment, and process discipline, and now that technology is integrated into business initiatives rather than treated as a separate entity, BPM has changed dramatically. A value chain can boost this process by providing useful analysis of associated business activities in order to improve relationships and practices that keep customers satisfied. The business model, coupled with an understanding of business capabilities, is the basis for the operational, technology, and information decisions that support a successful value chain system. The value chain model, while important, is only one part of a company’s overall business model or strategy. Through the prism of the linkages identified in a value chain model, a business can recognize cost relief and differentiations. The chain supports the business by following the inputs, building, and outputs that place a physical product into the hands of the end user. The value chain and business model are successful when processes are cost-effective, and they provide a desirable outcome that includes profitability, brand loyalty, and repeat business. Physical/Traditional Value Chains: Involve physical, tangible resources. Business-Unit Value Chains: Focus on specific business units rather than the entire organization, and may integrate with other internal value chains. Global Value Chains: Cross borders or regions and may include multinational partnerships and trade agreements. Food and Beverage: Value chain modeling for food and beverage providers follows the flow that begins with sourcing materials and concludes in customer consumption. For example, Starbucks will begin with the costs and processes associated with coffee bean sourcing through the customization of coffee beverages and delivery to the customer. Delivery Service: These service providers, such as FedEx, UPS, and USPS, invest in infrastructure and services to improve the speed of delivery, control costs, and manage capacity. Their value chain models will allow them to analyze logistics associated with the delivery of goods in a complex environment that is impacted by third-party suppliers, storage locations, and transportation regulations. Online and Brick-and-Mortar Retail: The retail value chain defines actions that allow businesses, such as Amazon and Walmart, to sell goods to customers. Amazon focuses on being “the Earth’s most customer-centric company” and seeks improvements in order to meet their mission. Walmart is constantly evaluating suppliers in order to keep costs low for their customers. Their value chains allow them to monitor each action throughout the entire process from product creation to inventory storage and distribution to customers. The below sample takes Porter’s value chain model and inputs primary and support activities that may relate to a large retail establishment, such as Walmart. This sample template can be used as a guide for any organization in any vertical. The examples of companies that use value chains are a “who’s who” of the world marketplace. You see Rolls-Royce, Starbucks, and McDonalds, along with names in every industry, including banking, farming, and communications. CRM Value Chain: The processes, flow, and costs associated with the customer journey and experience delivered through customer relationship management (CRM) value chain follows a customer’s interactions and identifies opportunities for enhanced relationships and value. Brand Value Chain: Identifies tangible and intangible differentiations that lead you to secure and enjoy the benefits associated with a strong brand identity and its high level of value in the marketplace. Hospital/Medical Value Chain: Hospitals use a five-point version of a value chain to focus on patient-centered care that provides the expected level of value at less cost. Even governments, world agencies, and humanitarian organizations use value chains to identify and optimize value propositions that are specifically constructed to combat poverty, provide economic relief, and build needed infrastructure, all while honoring and encouraging distinctive cultural practices. For example, tomato farmers in Ghana benefit from value chain analysis that includes geography, access to credit, government interference, and improved cultivation practices. This article has demonstrated valuable benefits that local, national, and international organizations experience through the four direct and five indirect activities of value chain modeling. But there are challenges. One of the biggest is the task of identifying thousands of direct and indirect tasks and activities that impact a value chain. The unique needs of individual organizations and industries cannot be templated, and as a result, identifying tasks and developing a plan can become extremely time-consuming. A value chain is a tool for constructing relationships in order to identify profit areas and competitive differentiators. Unfortunately, a value chain is not static and demands constant attention, evaluation, and updating in order to keep up with business progress. As Michael Porter says, “Competitive advantage frequently comes from perceiving new ways to configure and manage the entire value system.” When Porter introduced the value chain, computers and mobile devices were not ubiquitous, yet the model has been adaptable to these new realities. It is up to the each organization to build and deploy a value chain that keeps pace with evolving technology, adapts to a changing workforce, and expands with the global economy. 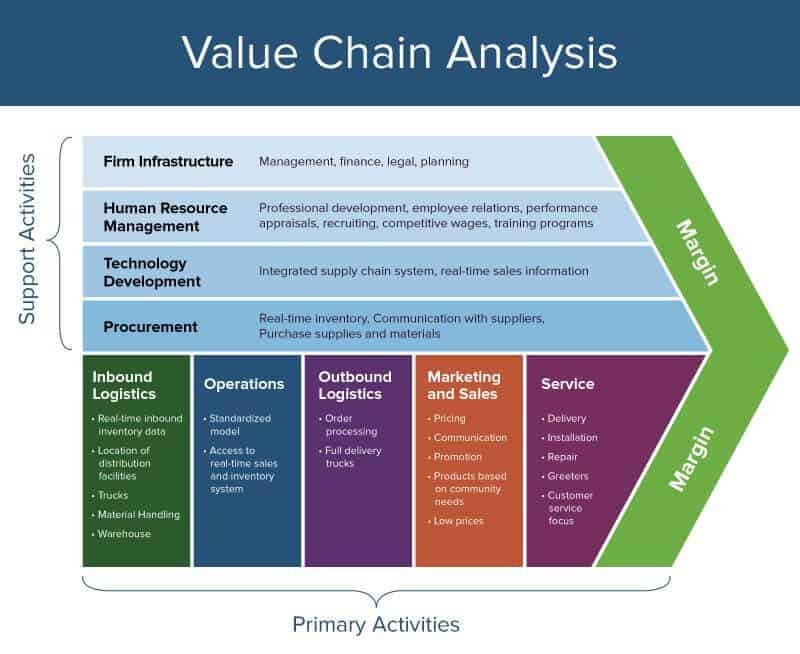 Those working with or interested in value chain analysis can find a variety of professional organizations, best practices, tools, and methodologies dedicated to the topic. The Supply Chain Council is a global consortium of over 700 organizations that manage the Supply Chain Organizational Reference (SCOR). 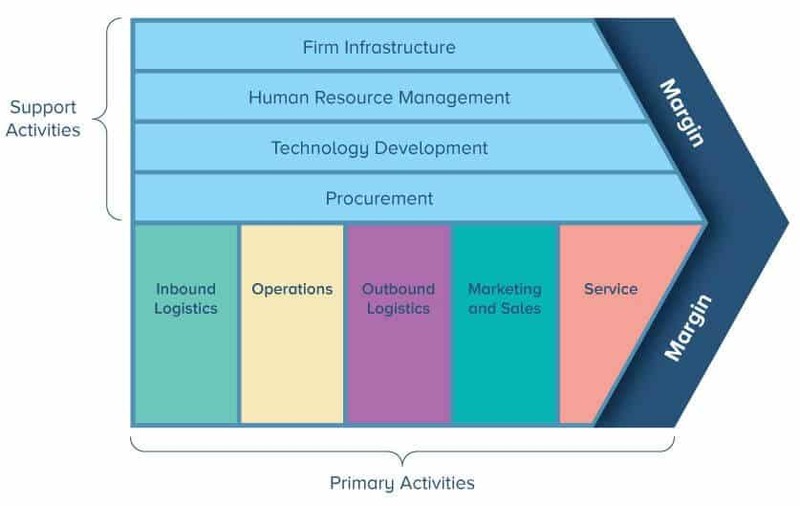 SCOR is a reference model for activities associated to the Porter model: supply chain, planning, procurement, manufacturing, order management, logistics, returns/retail, product design, research, prototypes, integration, launch, CRM, service support, sales, after-sale service, and contract management. The U.S. Department of Defense has adopted the newer design chain operations reference (DCOR) model. DCOR is a process framework for developing processes, metrics, and practices into a unified structure. The DOD does not focus on sales or marketing activities in its overall value chain. The e3 value methodology is a stepped approach to developing business models across networks of customers, suppliers, and suppliers of suppliers. HoloMapping® and ValueNet Works™ analysis, developed by Verna Allee, provide a whole system understanding of the value network. An efficient value chain can offer cost reduction, competitive differentiation, and higher profitability, all while decreasing waste within your organization. Ultimately, identifying your value chain can improve process efficiency. To maximize these efforts, however, consider using an online platform to execute on your value chain model and streamline processes across your organization. One such tool is Smartsheet, an enterprise work management platform that fundamentally changes the way teams, leaders, and businesses get work done. Over 74,000 brands and millions of information workers trust Smartsheet as the best way to plan, capture, manage, automate, and report on work. Get from idea to impact, fast, by building powerful, automated business processes in Smartsheet.